Does Psoriasis Increase Lymphoma Risk? A recent study found a small but statistically real increased risk for lymphoma and two other cancers in patients with psoriasis. But, there may be more to this story than meets the eye. Psoriasis is one of the most common skin diseases, associated with symptoms such as itch, pain, or bleeding. The involved areas of skin appear as red, raised areas called plaques, which may be covered with a coarse silvery scaling. Different forms of psoriasis can have different appearances and different patterns of involved skin. Lymphoma is cancer that affects lymphocytes, a kind of white blood cell which is found in the blood and also located in bone marrow and lymph nodes. Hodgkin’s lymphoma, or HL, and non-Hodgkin’s lymphoma, or NHL, are the two main categories of lymphoma. 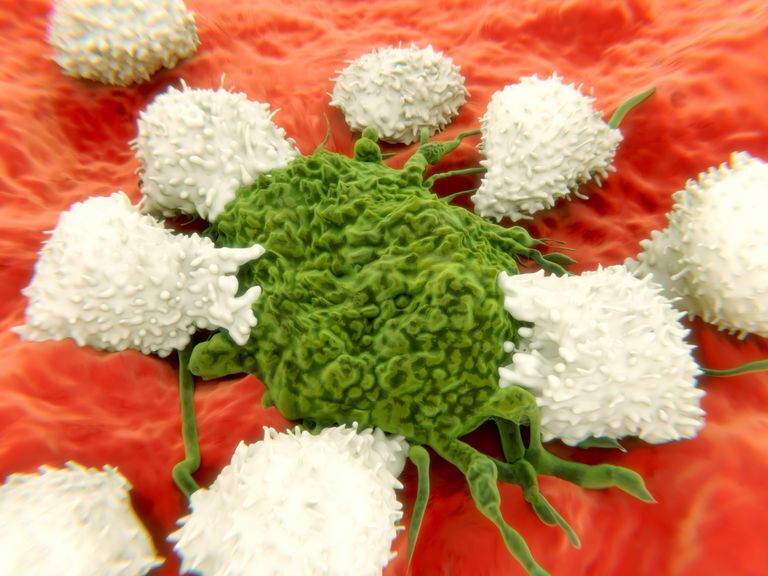 Because lymphocytes are a part of the immune system, researchers have wondered about the connections between immune diseases and lymphoma. To date, they continue to try to understand the relationships between the two. The American Cancer Society (ACS) does not currently list psoriasis specifically as a risk factor for lymphoma. They do, however, include autoimmune diseases in their list of risk factors for NHL, mentioning rheumatoid arthritis and systemic lupus erythematosus as examples. Rheumatoid arthritis, psoriasis, and inflammatory bowel disease (IBD) have all been shown to be associated with an increased risk of lymphoma in some, but not all studies. An overactive immune system in autoimmune diseases may make lymphocytes grow and divide more often than normal, potentially increasing the risk of lymphoma developing. As the ACS points out, however, people who get NHL may have few or no known risk factors; and even if a person with NHL has one or more risk factors, it is often very hard to know how much these factors might have contributed to the lymphoma. Increased rates of lymphoma have been reported in a number of studies of patients with psoriasis. And the risk of lymphoma with biological agents, in general, has been a topic of much debate. Biologic agents have a role in the treatment of diseases like rheumatoid arthritis and psoriasis. While they have been demonstrated to be relatively safe, they work by suppressing the immune system—so there is concern that this could raise the risk for certain cancers. Even though lymphoma is of great public health importance, statistically it is relatively rare compared to psoriasis, which has made it difficult to get high enough numbers to analyze. Having psoriasis is statistically associated with a number of factors, like smoking, obesity, and ultraviolet therapy and drugs that suppress the immune system. These factors may increase the risk of lymphoma and other cancers, independent of psoriasis itself. Recently, researchers analyzed records from 198,366 patients with psoriasis and 937,716 without psoriasis using a database in the United Kingdom. Results showed that there was a small but "statistically real" increased risk for non-melanoma skin cancer, lymphoma, and lung cancer in people who had psoriasis. These researchers found that cancer risk was slightly higher for patients who were classified as having moderate-to-severe psoriasis as opposed to mild disease. There was no significant association between psoriasis and cancer of the breast, colon, prostate, or leukemia, however. Even more recently, doctors from the Center for Dermatology Research at Wake Forest School of Medicine in Winston-Salem, North Carolina conducted a related study. They noted that psoriasis is associated with many other varied health conditions or comorbidities. They also felt that the measurement of risk from psoriasis—often reported to doctors and patients as the relative risk—might not be the best measurement. While relative risk can be useful, the authors felt that thinking about risks in relative terms, rather than absolute terms, would tend to lead people to overestimate the effect of psoriasis. *In order to attribute one case of lymphoma to psoriasis, a doctor would have to see 5,823 patients with psoriasis. Saleem M, Kesty C, Feldman S. Relative versus absolute risk of comorbidities in patients with psoriasis. J Am Acad Dermatol. 2016 Dec 13. pii: S0190-9622. Fuxench ZC, Shin DB, Beatty AO, Gelfand JM. The risk of cancer in patients with psoriasis: a population-based cohort study in the Health Improvement Network [published online ahead of print December 16, 2015]. JAMA Oncol. Boehncke WH, Boehncke S. More than skin-deep: the many dimensions of the psoriatic disease. Swiss Med Wkly. 2014;144:w13968.